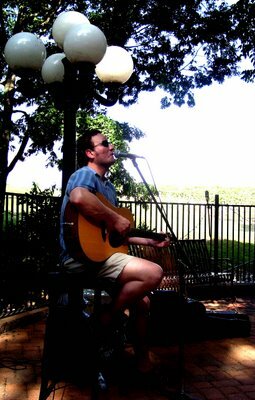 Just got this photo, taken by Dave Henerfauth, from my Memorial Day gig at Shorr Lake Winery in Waterloo, IL. Thanks for the pic, Dave! D’Vine Wines in downtown Kirkwood, MO on Saturday, November 25th. Stop on in, have a glass of vino if you’re of age, and sing along with some sub-par Pink Floyd and Bruce Springsteen tunes! Start time around 7:00 p.m. Lisa, the vinmistress, is a wonderful gal and a pleasure to work with… not to mention she makes some great dry whites! You look too cool for school Marcus.